Title : Who's Your Daddy? 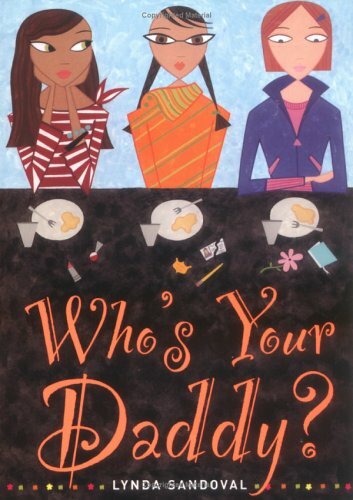 Reviewed by Me for TeensReadToo.comThere is only one word for WHO'S YOUR DADDY?--laugh-out-loud hilarious. Wait, I think that might actually count as four words. Or if you take into account the hyphens, at least two. Anyway, you catch my drift. I laughed through the entire three-hundred plus pages of this book, and now have only one request. Please, please, please make this book into a movie! Meet three best friends unlike (or very much like) anyone you've ever known. There's Lila Moreno, whose dad happens to be not only a hottie widower sought after by all the town's women, but the police chief of White Peaks, Colorado. Then there's Meryl Morgenstern, who although she was named after Meryl Streep, is totally anti-pop culture, including television. Her dad is also the Vice President of discipline, the driver's ed teacher, and the assistant football coach at the high school they attend. And then there's Caressa Thibodoux, who has a very famous retired blues musician for a father, and also happens to live in a log cabin house that can only be described as a mansion. When you're sixteen, having the types of fathers these girls have does not put you high up on the popularity list. You're either too pretty and rich (Caressa), too weird (Meryl, who doesn't even know who Buffy is), or way, way off the instant-dateability list (Lila, whose dad is, you remember, the Chief of Police). So what are three girls to do? Especially three girls who are desperate to gain dates to the homecoming dance? Well, the only thing three pretty, intelligent, intimidating girls can do. They stage a Dumb Supper, hoping that between the supernatural energy of having a meal entirely backwards combined with the helping-hand of the ghost of Lila's mother will help them in their search for a date. All they have to do is write down their wish, and after the Supper the first guy they see will be their one-true-love. At least that's how it's supposed to work, but in the lives of Lila and her friends, few things rarely ever go as planned. The first guy Lila runs into is Dylan Sebring, lieutenant of the junior narcotics squad, otherwise known as the Police Explorers. If there's anything Lila doesn't need in her life, it's another cop. Her father and brother are enough, thank you very much. The first guy Meryl meets is Ismet, previously known only as That Bosnian Guy. Meryl's pretty sure things are looking up, until she realizes that the only type of girl Ismet wants is a typical, fully-submerged-in-American-culture teen, which Meryl most certainly is not. And as for Caressa? Her bright idea is to get musician Bobby Slade to ask her to the dance, which ends up with, you guessed it, some humiliating results. WHO'S YOUR DADDY? is a downright funny, entertaining read. You won't go wrong reading this book for many reasons, the least of which is the exercise to your smile muscles. I skimmed the first two pages of this book and the premise seemed silly and fun: three girls doomed by their dads to never have dates. (One dad is a Vice Principal, one's the Police Chief, etc.) Plus, there was a Meryl Streep and a Buffy reference within those first two pages, so I thought there would be a lot of pop culturisms.Speaking of Buffy, does anybody remember how annoyingly Dawn was written? Like she was supposed to be 14 and they had her acting like she was 9? That's how this book was. Only the characters are actually supposed to be 16. No way.And the pop culture references? Tell me, what 16 year old in 2004 uses Christie Brinkley as an example?Then the book went in a completely new direction and actually outlined a pagan ritual. The main characters participate in a Dumb Supper to find out who they are "fated" to date. I guess this book is the fate I suffer for padding my numbers with Teen Fiction.At one point, the book was so bad, I considered not only not finishing it, but actually throwing it away instead of swapping it at the Book Corner.Then it got a little better. One of the characters wasn't so bad, and with her the author got right what it's like to be a dateless but smart and empowered girl at that age. Sometimes it is tempting to try to be the girl you think the guy wants. Whether you're 12 or 22.Then Sandoval went sappy and had them all with dates for the prom. Oh yeah, real empowering. Funny story about friendship and overcoming your parents' status. My inner teen totally related to this story! Well written, funny, and easy to follow. It is worth reading! This was a fun, quick read about 3 friends, Lila, Meryl and Caressa. It's junior year and they just want to have dates to the prom but they each feel they are boy repellent through no fault of their own. Lila's father is the chief of police, Meryl's family doesn't even own a TV and Caressa has a famous father, Blues legend, Tibby Lee. The 3 friends decide to hold a "dumb supper", a Celtic ritual they find in a book that will bring them the guys of their dreams. Lila is drawn to Dylan who she believes is the mini-me of her father and also has a girlfriend she refers to as Hellspawn, Meryl falls for Ismet, the Bosnian kid who doesn't see her as anything more than a friend and Caressa imagines her life with Bobby Slade, the 21 year old blues musician she just happens to see on the cover of a CD. Things don't go as plan at the dumb supper but in the end things work out for the girls. What I did really like was the friendship between the girls. I also liked the way the relationship between Lila and Dylan was handled. However, I was not a fan of the whole Meryl and Ismet thing or the Caressa and Bobby Slade thing. This is one of may favorite lines from the book when Dylan tells Lila he has broken up with Jennifer (Hellspawn) for good:"I have to say, it was an act of pure will and an amazing feat of brilliance that my facial expression didn't change, because my entire mind, body, and soul were doing a happy dance at the news." I thought this book had a really interesting plot and the writing was easy to relate to but it was a fun read kind of book. Its about 3 girls who happened to be good friends but they also shared one thing in common which is the fact that they have intimidating dads. This results in them never having boyfriends let alone dates. But through out the book, they decide to create a plot in order to get a date for the last dance of the year. Great book. I was laughing and I thought that the girls had a unique personality. The plot and how everything connected was great and I felt like the ending was just right and I had very little questions that I had to reread parts. I wish though that Caressa would have gotten a regular guy and not some older rockstar. I have re-read my copy of this book so many times the spine is starting to tear (note to self: be gentle with book). I don't have the faintest idea why, but I LOVE this book! It's great for a good laugh. This is the type of book that when I read it I just HAVE to have my friends read it. They liked it too! I highly recommend this book to any teenage girls out there! Don't be judgmental on the title. It is not a weird thing where the girls just turned 18 and are married to 60 year old guys. Its actually about 3 girls who have dads, that are authority figures. So guys don't want to go out with them cause their intimidated by their fathers. So they make a plan, that somewhat goes awry. This was a good book. Three friends are social outcasts because of who their dads are- a police chief, a dean of discipline at the high school, and a famous musician. They decide to hold a Dumb Supper- sort of a celtic ritual- in the hopes of being shown their soul mates. The book is funny and heartwarming, and I can relate to it. This book had me laughing at every page. Three girls + three intimidaitng dads= no dates. So what is a girl to do? simple. Get with your girlfriends to attend a dumb supper. But what do you do when it all goes wrong? I read it a few times at age 12 and liked it, but at age 20, I found it barely tolerable. I mean, I have no idea what compelled me to waste time with a reread since it won't coins towards my Book Challenge goals anyway. Yikes, badly written, poorly paced stuff. This book was pretty funny. It's about three girls that a lot of teenage girls will be able to relate to. It's lengthy but enjoyable. I wouldn't ue it as a whole group book. I'd probably just suggest this book for recreational reading. from this book i learned that sometimes it just takes patience. Juvenile and predictable. B-O-R-I-N-G. The title suggested otherwise and I was very let-down. this book was pretty funny. I love the plots. and yeah it's a cute teen fiction. I can't imagine what it would be if i was Lila. i haven't finished it yet. But, it's good enough! Funny! A teenage romance, so, naturally, I love it.